The apartment lies in the upper part of the village, the most attractive and panoramic part. The apartment lies in the upper part of the village, the most attractive and panoramic part, and can easily be reached along a small road about 100 metres from the car-park. It has been completely renovated with great care and has been furnished with particularly good taste and careful choice in the furnishings, the apartment is equipped with air-conditioning. The large terrace, which looks onto the gulf of Salerno and offers a fascinating view of the sea and the winding amalfi coast, has been furnished with a kitchen/barbecue and a table for dining outside. The village of Praiano, with its characteristic tranquillity, is one of the most sought-after residential areas on the Amalfi Coast and offers all the services that you might need: general food shops, bars and restaurants, and the pebble beach at Praia can be reached in 15 minutes on foot along the typical local lanes or by car along the main road that leads to Amalfi. This wonderful little beach, which is worth visiting both during the day and later, in the evening, can only be properly appreciated once you've seen it in person. In the little piazza and along the romantic path cut through the rock are some excellent restaurants. 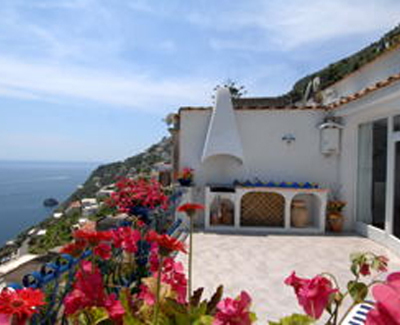 Positano is about 6 kms away and can also be reached from Praiano using the very convenient public transport. I Gabbiani has one pay car-parking space that can be booked beforehand by its guests. Ground Floor: large living-room with fireplace and exit onto the panoramic terrace, dining area and kitchen with dishwasher, studio / gymnasium with gym equipment and PC with internet connection, 1 double bedroom with bathroom with shower, 1 twin bedroom with access from the terrace, 1 bathroom with bath-tub. Large panoramic terrace with view of the sea and open-air kitchen. Car-parking space.